Update your bedroom with this sophisticated dot printed flannel 3-Piece Duvet Cover Set. Made of brushed 170-gsm cotton, the set features stylish multicolor dot pattern on white background for distinctive look. 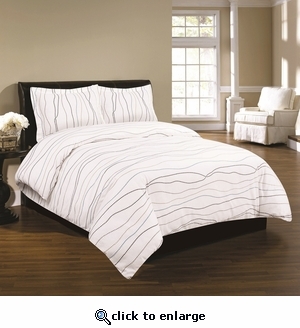 Set includes: One duvet cover and two shams. > Dot Print Flannel Duvet Cover Set. > Triple-brushed for softest finish and feel. > 170-gsm weight for incredibly warm comfort on the coldest nights. * One King Duvet Set - 110" x 96"
* Two King Shams - 20" x 36"
* One Queen Duvet Cover - 92" x 96"
* Two Standard Shams - 20" x 26"
Care Instructions: Machine Wash Cold with like colors, delicate cycle. Do not bleach. Tumble dry low. Remove promptly. Please include a copy of the original Invoice/Packing List in the package as this will expedite the return/exchange process. We recommend that you use tracking service when you return your purchase to us. If you wish, you could request us to email/mail you a pre-paid UPS return label by emailing customer service at customerservice@linensbargains.com. The cost of the return label would depend on the number and type of items you'd be returning. To exchange, return your original item(s) and include a note in the package with the name of the item(s) that you'd like to receive in exchange. Free Standard Shipping on all US Contiguous orders. No coupon code required.